Do you find it a struggle to eat healthy? It can be difficult, especially if you do a lot of traveling. Fresh fruit and vegetables can seem rather scarce when you're on the road. When you get back home, it's a good time to dig into something delicious but also more virtuous. 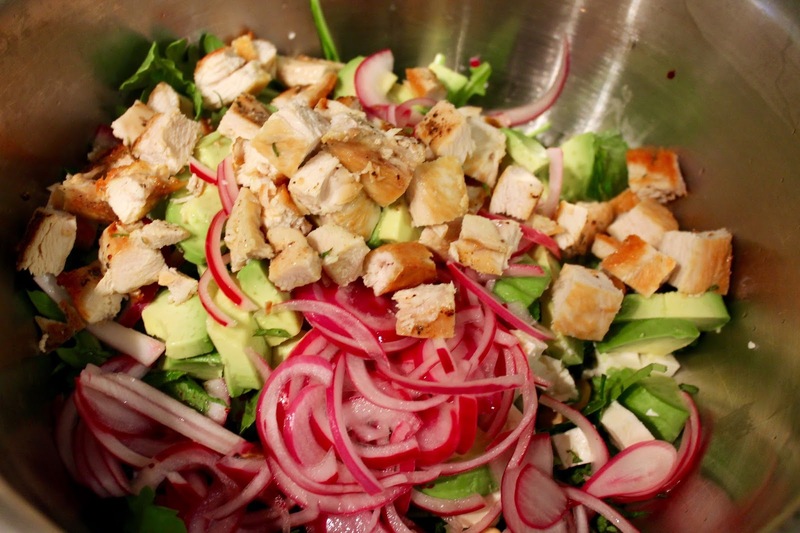 Grain salads are perfect for this. 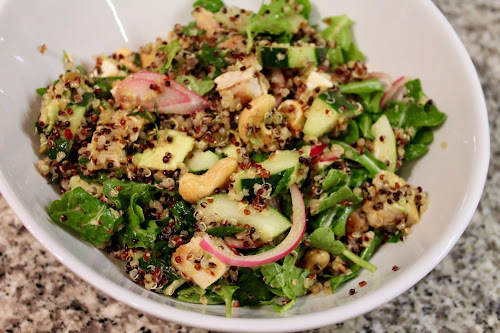 This quinoa salad was inspired by a recent lunch at Spring Street Natural, a cafe in Soho where Chris and I like to go for lunch after a morning of shopping and gallery hopping. This recipe is quite versatile. Consider it more like a suggestion. The combination of the cashews, avocado and quick-pickled onion are what make it special, but you could use other pickles, other nuts, other vegetables, etc. Note: To partially peel cucumber, use a vegetable peeler to cut parallel stripes along the side of the cucumber. 1. Bring 2 cups of water to boil. Place onions in a mesh sieve and slowly pour the boiling water over the onions. 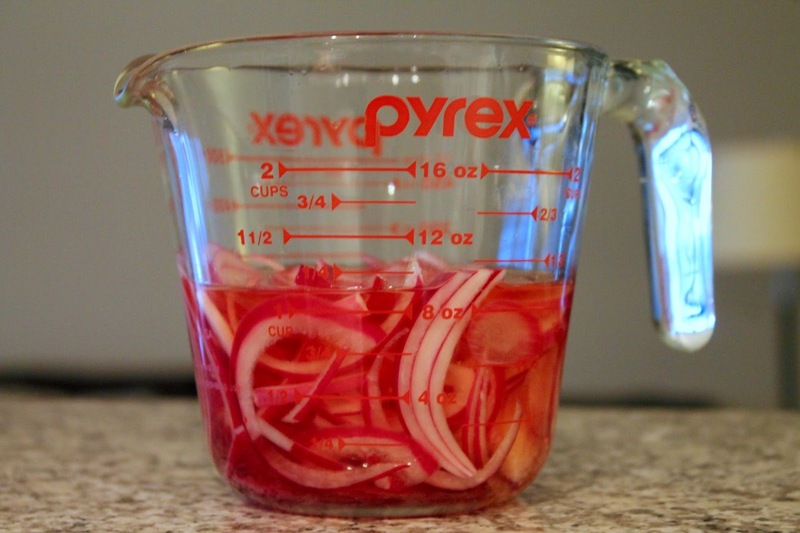 Add the onions to a jar or other small container. Combine the vinegar, sugar and salt until the latter two ingredients are dissolved and then add to the container with the onions. Allow the onions to pickle for at least 30 minutes (you can set them out on the counter for this time, but if you're going to let them pickle longer, I suggest putting them in the refrigerator). 2. Heat a medium saucepan over medium-high heat. 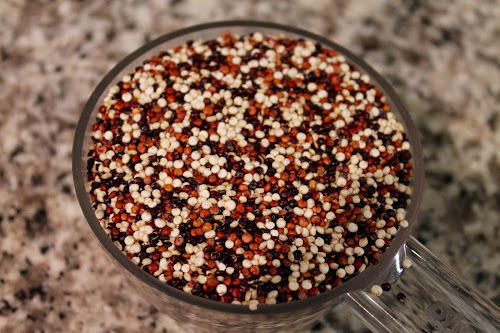 Add the quinoa (it's okay if it's still damp from rinsing) and toast, stirring occasionally, until the quinoa makes a frequently popping sound, about 5 to 7 minutes. Add the water and bring to a simmer. 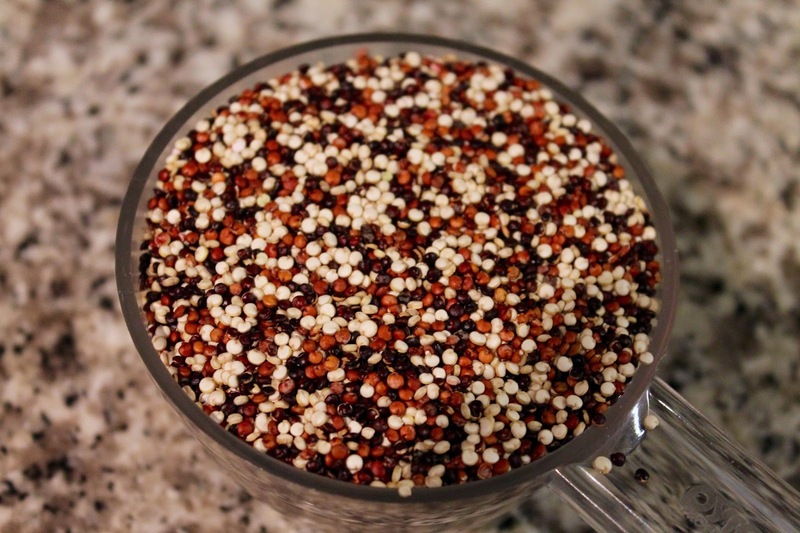 Cover the pot, reduce heat to low and simmer for about 18 to 20 minutes until the quinoa is tender. Remove from heat and keep covered for about 5 minutes. Remove lid, stir and allow to cool a bit. 3. Heat 2 tbsp. olive oil in a medium pan over medium heat. Pat the chicken breast cutlets dry and add to the pan. Season with salt and pepper and cook until cooked through and lightly browned, about 10 minutes, turning halfway. Set aside on a cutting board to cool a bit, then cut the chicken into cubes. 4. In a large salad bowl, combine arugula, cucumber, avocado, cashews, pepitas, mint, aleppo pepper and feta cheese. Drain the pickled onions and add then the bowl. Add the cooked chicken and quinoa. Whisk together the dressing ingredients and pour over salad. Toss to combine and serve in large shallow bowls.